I'm here to announce the winner of the Navitas Product. 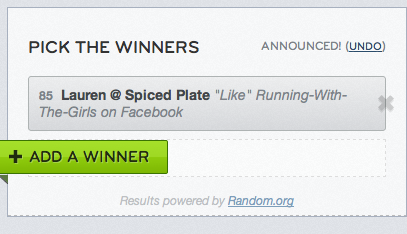 The winner is Lauren @ The Spiced Plate. Have you ever been her blog? You should head on over to check out some of her excellent, healthy recipes. I love her ideas and enjoy her writing style. I also need to add that she is a Maine blogger as well. Congratulations, Lauren!!! Lauren, if you could email me at runningwiththegirls AT gmail DOT com in the next 48 hours with you Navitas choice and mailing address (not PO Box), I can get it out to the Navitas team. Jen - You really need to! She has some incredible and super healthy ideas. Congratulations Lauren! I should check out her blog, even though I live in New York now I am a Mainer at heart! Love the Mainer at heart!!! Thank you so much Jen for your kind words! They brightened up my day! Anytime, dear Lauren! You are a joy to read and congratulations again!